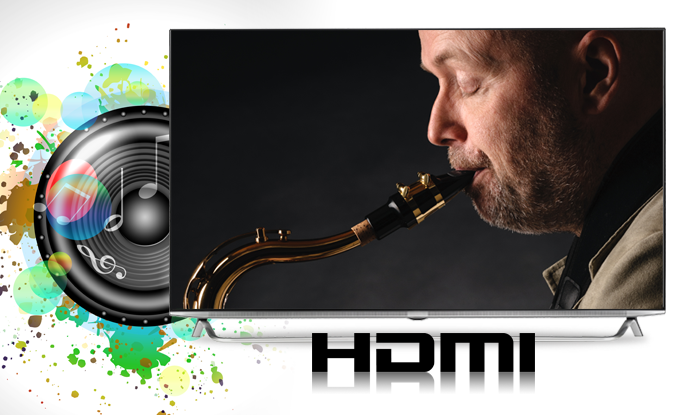 HDR-7500T lets you watch and record digital TV, use YouTube, SBS on Demand and Quickflix and access content from your network and USB hard drives. 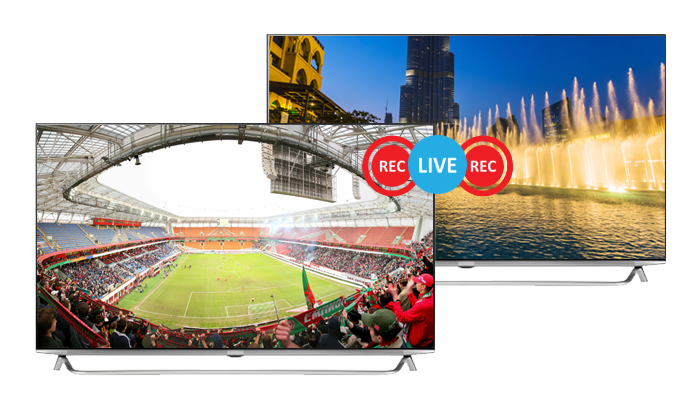 IceTV is a software service that manages all your TV recording for you. IceTV’s Intelligent recording software and program discovery tools help you find good TV shows you may have never thought of, and our smart recording features ensure you won’t miss them. Features such as keyword alerts, keyword recording and smart series recording help you manage your recordings with a tap of an app or the click of a mouse. Just sit back at home and replay, at a time that suits you. Importantly, for accurate program recording, IceTV’s team hand-curates the most reliable Free-to-Air TV Guide, so whether shows change time slots, channels or name, you won’t miss them and instead you’ll enjoy watching TV. Our service is provided via our smartphone apps or website so you can easily use it wherever you are, only having to turn on the TV to enjoy your recorded TV shows. IceTV enables you to control every aspect of recording of Free-to-Air TV – It’s your own personalised catch-up TV experience. That’s the power of IceTV. 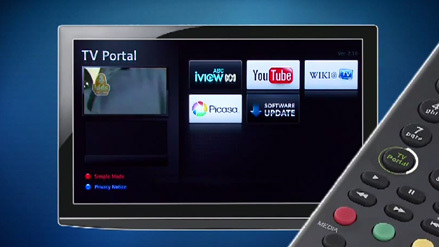 Access popular online content from the comfort of your living room. The TV Apps is your gateway to a host of extra catch-up and on-demand services. Simply hook up the receiver to your home network using Ethernet cable, powerline adaptors or a Humax wireless dongle, to access a wide range of services including Plus7 and Quickflix. (Contents subject to change. Internet connection required) Additional services are planned for the near future. We’ve just doubled your pleasure. Can’t decide on which show to record? Now there’s no need to choose between two shows. You can record both at the same time. Time is in the palm of your hands. You get to control time. Play back your show while it’s being recorded, pause it, and resume again when you’re ready. Or watch your favourite scenes again and again, and skip over parts you don’t want. Access your digital media files from any drive in your home. Gather all your media and stream it anywhere at home. 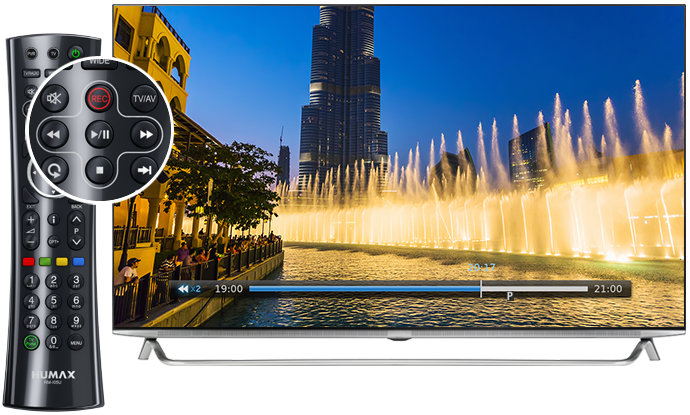 Enjoy high-definition video and audio as they were meant to be. Just connect the High-Definition Multimedia Interface (HDMI) cable to any HD source and enjoy the optimized pictures and sounds each and every time. 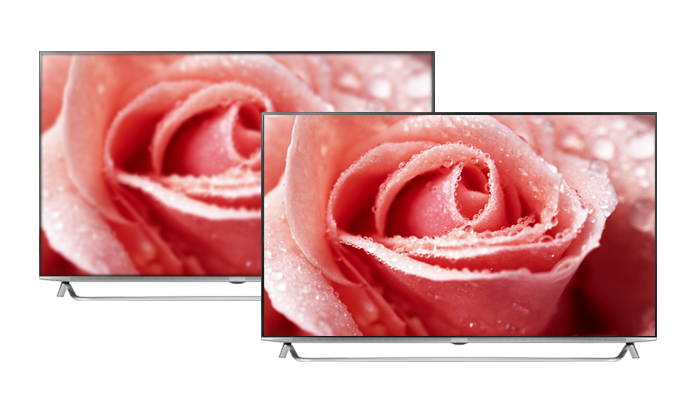 Go upscale to full 1080p HD. 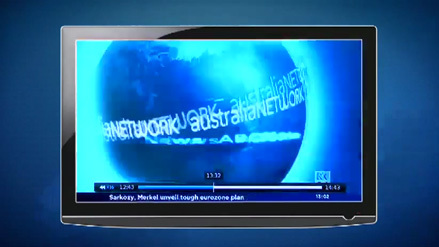 With the upscaling feature, even standard definition programmes look and feel like HD programmes. 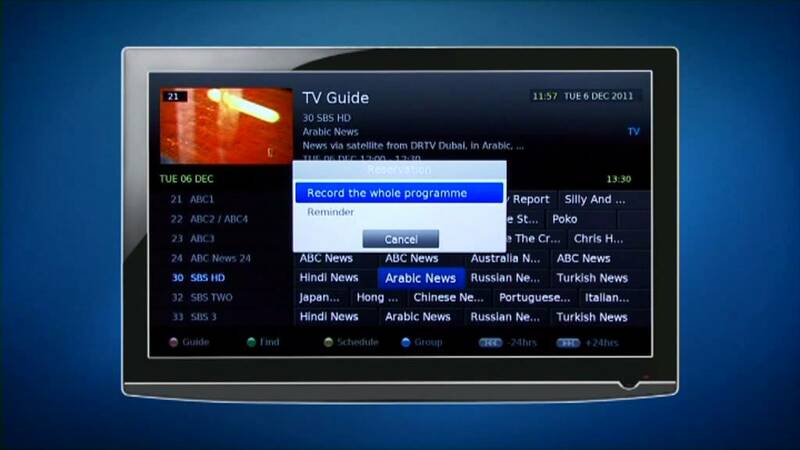 EPG with all information you need including programmeinformation, date, time, and even classifications. 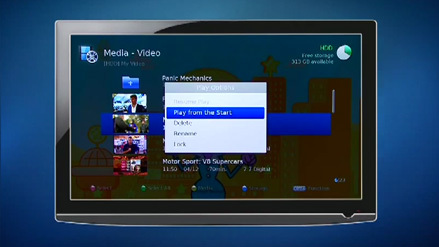 After one time visit, EPG will be automatically refreshed without manual input. 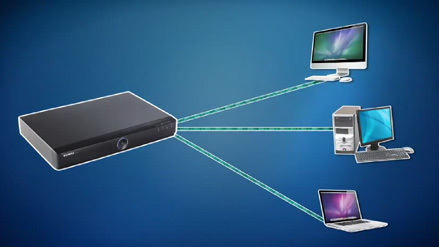 Easy EPG operation with better performance and accuracy. * Free series recording feature depends on broadcast network conditions and compatibility. How do I delete an upper folder? Upper folder is not a folder or a file that you can delete. It is there for you to use as a 'back' function. How to make it a passive mode? Please go Menu-Settings-Power Management and see if Automatic Power Down is On. If it's 'On' and HDR-7500T is left with no control for 3 hours, it is set to turn off itself to save energy. Please also make sure if Power Off Timer is on or not by going Menu-Settings-Preferences-Time. Can I use a HUMAX PVR bought from overseas in AUS? 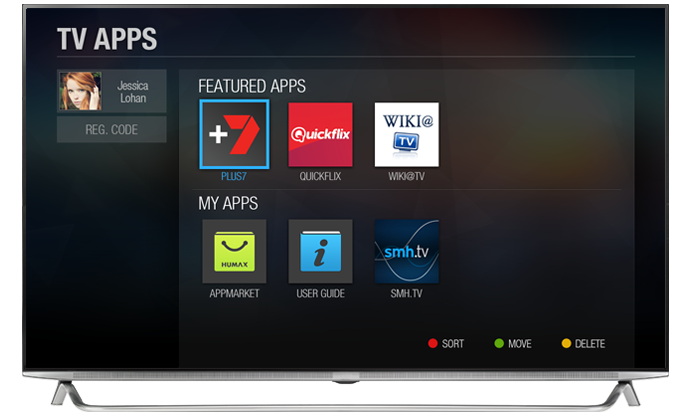 HUMAX products that are not sold in Australia will not be usable in Australia and customer service will also not be provided. How do I set the padding time? TV portal is not working. Please make sure that the internet is properly connected. - Check to see if there is a green light on a dongle. - Please go Menu-Settings-System-System Information and see if it says 'Network Connected' below. - Please go Menu-Settings-System-Internet Setting-Configure Lan and see if HDR-7500T is getting proper IP Address, Netmask, Gateway Address and DNS Address. Please note that due to customers' environments, the internet speed can be slow and therefore would cause delay in accessing TV Portal. HDR 7500T does not recognize big external HDD. 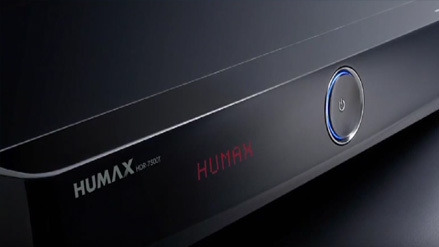 HUMAX recommends customers to use external HDD that is up to 1TB. If external HDD is making a ticking sound, it may mean that there is not sufficient electricity going through. Please connect the power cable of the external HDD or put another USB cable in HDR-7500T. How to read files from the external HDD? Put External HDD in the USB port and press Media then a blue button(storage). Then, select USB. Select a file you want to play out of the USB then press 'OK' button. How to move files on to the external HDD? Press a Media button and blue highlight a file or a folder you want to move and then select 'OPT+' button that is located below the volume control area and press 'OK' on 'Move/Copy'. When Move/Copy Files message comes up, blue highlight 'External' and press a red button on the remote. Please note that once you move or copy a file or a folder there will be a 'Deleting' Sign on the top right hand corner and please do not switch off before that message disappears. If you want to delete more than one file or a folder you can use a red button to ticket those files or folders you want to delete at the same time. Check the main power cable and make sure it is plugged into a suitable power outlet. Check that the mains supply is switched on. Connect the power cable to a different power outlet. Make sure that the AV,HDMI or Component cable is firmly connected to the TV. Check the brightness level of the TV. Check if the channel is currently on air. Contact the broadcaster to ensure that the channel is running. Make sure there is no mobile phone or microwave oven near the product. Keep the power and the RF cables apart from each other. Note: If the antenna is covered with snow or the RF is weakened by heavy rain, or strong winds may change the position of the antenna, the condition of the sound and picture may temporarily be poor. However, the poor sound and picture quality due to weather conditions cannot be accepted as a malfunction of product. [Terrestrial] Adjust the antenna direction to get a better picture. Check that your AV, HDMI or Component cable is connected correctly. Check the volume levels of your TV set and the product. Check if the product or TV is on mute. Remote control does not operate. To control the product, the top end of the remote control should point directly towards the receiving part of the product. Remove and reinsert the batteries in the remote control. Replace the batteries in the remote control for a new set. Check that no previous reservations are conflicting with the new reservation. No password information is given. The default password is always 0000. Channel search does not work. Please make sure that antenna cable is appropriately connected to the HUMAX product. [Terrestrial] Use the appropriate antenna capable of receiving VHF or UHF channels for your area. 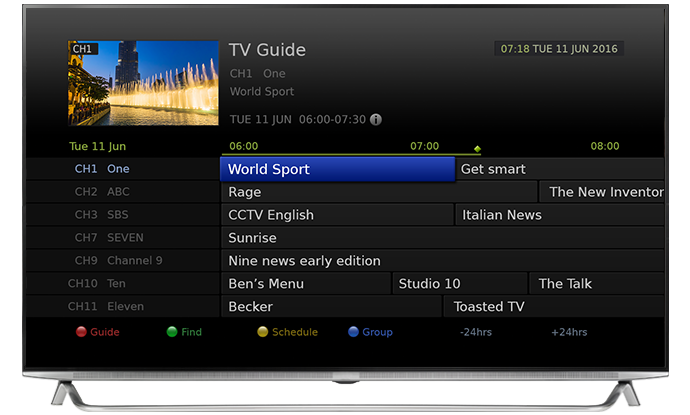 If your HDR-7500T is connected on the internet, you can go to TV Portal and run 'Software Update' application to update new software. If your HDR-7500T is not connected on the internet, you can update new software through USB. 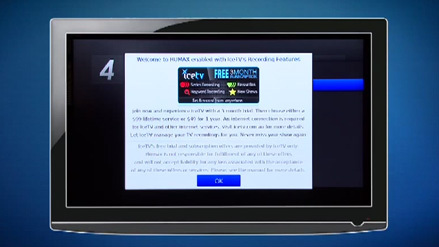 Please visit //www.humaxdigital.com/au/support/ for more information about how to update new software through USB. The product makes a humming noise. Please make sure that there is no dust around the fan. If the symptom persists, please call HUMAX customer service on 1300 737 937. The hard disk is full. Delete unnecessary programmes and make space for new recording. Check if recording is conflicted with another channel. Stop the current recording or wait until the recording is finished. Check that the product is switched on when recording starts. If you are missing first or end bits of the program, please set some padding time by going to Menu-Settings-Preferences-Recording-Start and End padding time. The signal during recording may be weak or the hard disk too full. Playing back on live TV is only available after 30 seconds you have been in the channel. If there are 2 programs being recorded, you can't move to a channel that is not a sister channel of the channel being recorded. How to delete a folder/program in media? Press a Media button on the remote and move to a file or a folder you want to delete and press an 'OPT+' button which is located below the volume control area and delete. Make sure that the AV, HDMI or Component cable is firmly connected to the TV. Make sure that the antenna cable is properly connected to the product. 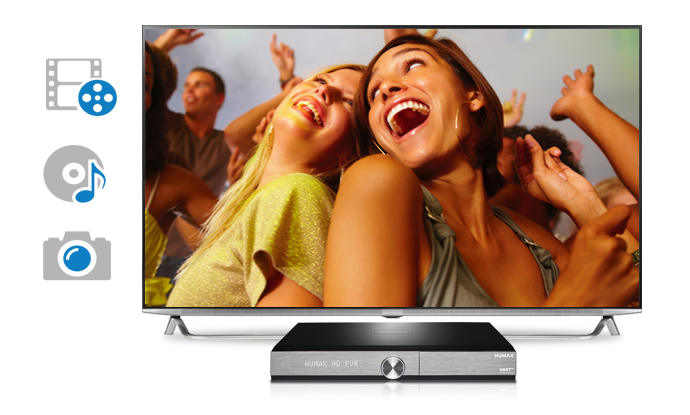 Press the SOURCE button and select AV, HDMI or Component mode depending on the type of connection between HDR-7500T and the TV. Satellite: Make sure that the antenna setting in the menu is correct.